Cardboard Boxer is a relentlessly dour drama about homelessness, and it operates in extremes. In one corner, it depicts the saddening day-to-day activities of people surviving on the streets, who have a decent day when they find chunks of uneaten fast food in the trash and receive a few dollars from passersby. In the other corner, the film's purpose for existing revolves around an exploitative concept that was popularized about a decade prior, where wealthy twenty-something kids go around with cameras and pay homeless people to fight one another. The feature film debut from one of the producers of Jackass, Knate Gwaltney, Cardboard Boxer undermines the honest, always relevant efforts of the former with the tone-shifting jabs of the latter, building into an unpleasant cocktail of the real struggles of those on Skid Row with the degrees that some could debase themselves to have the comfort of shelter, the warmth of companionship, and a flash of notoriety. 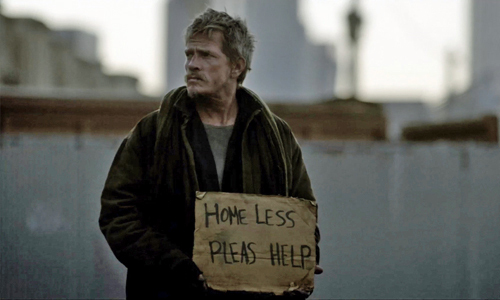 Thomas Haden Church plays Willie, a gaunt, wiry bearded man who occupies a box along the streets of an unnamed city. Alongside many of the other denizens of Skid Row, he scrawls messages on sheets of cardboard and hopes for daily donations from the better-off folks along the road, almost vying for attention between them. A poor taxi driver (Terrence Howard) offers intermittent reliefs for the homeless, bringing them food and comforts to the best of his abilities, to which Willie isn't a priority among the driver's closer friends in the community. Things look bad for Willie, but that gets interrupted when a black SUV rolls up and the college-aged kids inside instigate a fight between the homeless men, to which Willie decides to participate for a little cash. After his experience with the taped fighting, Willie gets a taste of comfort in how he spends his money, and that leads him to further engage in the fights whenever the kids roll through. Lots of saddening development occurs in Cardboard Boxer that's focused on the limbo that Willie copes with on a daily basis, given added bleakness by the things that keep him going and the people with whom he interacts. He develops a one-sided relationship with the passages of a diary he discovers while dumpster-driving, which are the musings of a young girl coping with the death of her mother after an illness, a figure whom he begins to consider a friend despite never meeting her. In his actual surroundings, he maintains a hostile and complicated kinship with Pinky (Boys Holbrook), a legless war veteran, while contemplating the nearby port-a-potties that are a front for cheap prostitution. Knate Gwaltney might have noble intentions by including these side elements, tying Willie's hopelessness to the musings of someone with a roof above their head and shining a light on the mistreatment of disabled veterans, but there isn't enough depth within them to justify how they make an already disheartening depiction even more so. For a film so concerned with exploring the emotional gravity of life on the streets, however, Cardboard Boxer pulls its punches when it comes to fleshing out Willie as an individual. Granted, part of that appears to be by design: the film reveals hardly anything about Willie's life before he hit the streets, which leaves him in an ambiguous, somewhat faceless state that could apply to any number of homeless individuals wandering the streets right now. This also creates something of a disconnect, though, where the choices he makes and the glimpses we're given at his attitude have no strong foundation to which someone can reference, little motivation beyond what we're intended to decipher in his routine. While there's some dramatic novelty behind these ideas, and Thomas Haden Church's weathered, browbeaten performance communicates a specific kind of morally adaptable and muddled individual, this doesn't work as a sturdy look at who Willie is -- or was -- as a person, but more of a glimpse at nothing more than the ghost lingering in his place. The lack of definition to the lead character's identity further burdens the fight scenes in Cardboard Boxer, making brawls between homeless individuals even more unenjoyable than they already would be. There's no sport to be found in the grimy, unseasoned brutality, no engaging attraction to the blows landed or the footwork of dodging punches, accentuated by obnoxious chatter from wealthy twenty-somethings. Powered by jittery and intentionally sloppy camerawork, the fights are all built upon the dramatic overtones in how these already destitute individuals are lured into "gladiatorial" barbarity, strictly for the $50 that'll go towards a meal, a sexual rendezvous, or a hotel room for a night of normal human existence. Knate Gwaltney ensures, because of this, that the right messages are telegraphed about self-worth and the toxic swaying power of money amongst the truly impoverished, but one can't help but feel like Cardboard Boxer surrounds Willie with depressing, nihilistic elements just so we can observe the damage they inflict upon him.